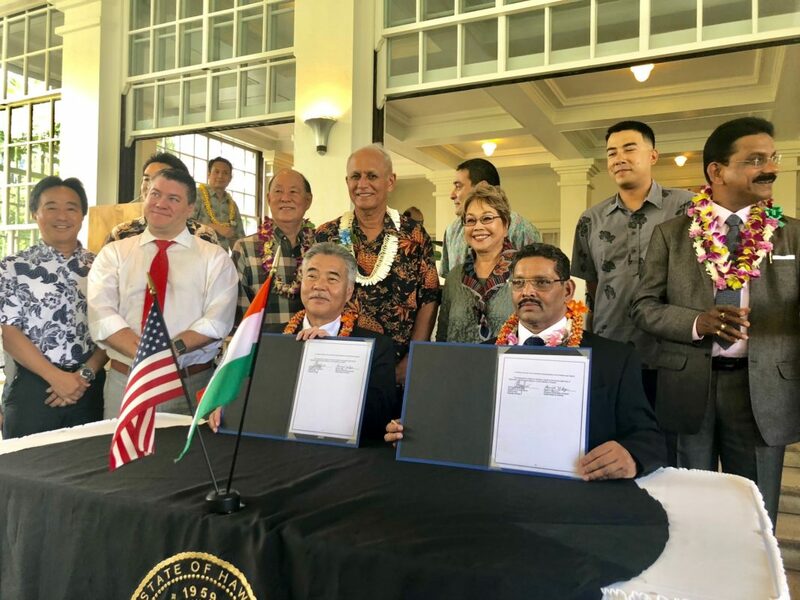 The State of Hawaii and Goa, India, signed an agreement to enter into a sister-state relationship today. Hawaii Gov. David Y. Ige, signed a historic agreement with delegates from Goa, a state in India, which is Hawaii’s first sister-state relationship with a jurisdiction in India. The Director of Art and Culture, Gurudas Pilarnekar, signed on behalf of the Goa state government. The signing ceremony took place at Washington Place in Honolulu. The agreement will promote trade, tourism, information technology, and exchange of health and wellness, agriculture, culinary art, education and cultural programs between private sector organizations and universities of both states. “Our new sister-state relationship allows Hawaii to advance business, academic and cultural areas, and engage with the world to increase economic opportunities for Hawaii,” said DBEDT Director Luis P. Salaveria.